Mpho can no longer preside at holy communion, weddings, baptisms or funerals after handing in her licence because the church does not recognise gay marriage. She said her father, the retired archbishop and celebrated anti-apartheid campaigner, was "sad but not surprised" at the news. 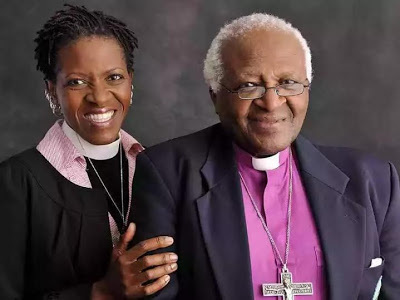 "The canon (law) of the South African Church states that marriage is between one man and one woman," Tutu-van Furth said in an email. "After my marriage... the Bishop of Saldanha Bay was advised that he must revoke my licence. I offered to return my licence rather than require that he take it from me." Desmond Tutu, 84, who has been in frail health, attended the celebrations with his wife. He has previously spoken out in favour of gay marriage. Marceline Tutu-van Furth is an Amsterdam-based professor specialising in paediatric infections. The couple -- who are both divorced and have children -- officially tied the knot in the Netherlands in December. "My wife and I meet across almost every dimension of difference. Some of our differences are obvious; she is tall and white, I am black and vertically challenged," Mpho told the South African City Press newspaper. "Ironically, coming from a past where difference was the instrument of division, it is our sameness that is now the cause of distress," she said in a reference to apartheid. Senior local priest Bruce Jenneker told AFP that the Saldanha diocese had received Mpho's licence with "sadness". "It was a great pity that it had to happen," he added.